Our listeners submitted some great questions! How do you fairly and even-handedly write a deeply compelling character you deeply dislike? What’s the best way to discuss a character’s underlying motivations without expressly stating them in narrative or dialog? How well should characters understand their own motivations? How do you make non-violent characters interesting? Can there be too much depth to a character? How do you balance character depth across multiple attributes? How do you make a character motivation seem deep when most people’s motivations are actually pretty shallow? Do you create standard dossiers for your characters? Does your story have to have a villain? How do you know whether or not a character’s voice is working? Do you track words or phrases that are unique to a particular character’s voice? 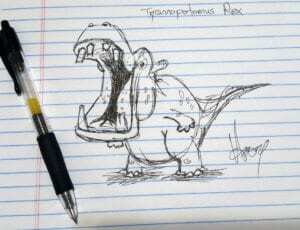 Liner Notes: Brandon mentioned Howard’s “Tyrannopotomus Rex” doodle as part of the writing prompt. Here it is, should you need visual reference. My introduction to There Will Come Soft Rains was an audio version on Dimension X. https://youtu.be/HF7954TWz2k So far as I can tell, that was in 1950. I would have been 7 or 8 years old. I remember thinking that the house must be sad. IMHO the house is a character. Also, it was paired with Zero Hour. These are th first SF stories that I remember.